The vacation home shown above incorporates both, sinker cypress windows and doors, into its stylish architecture. 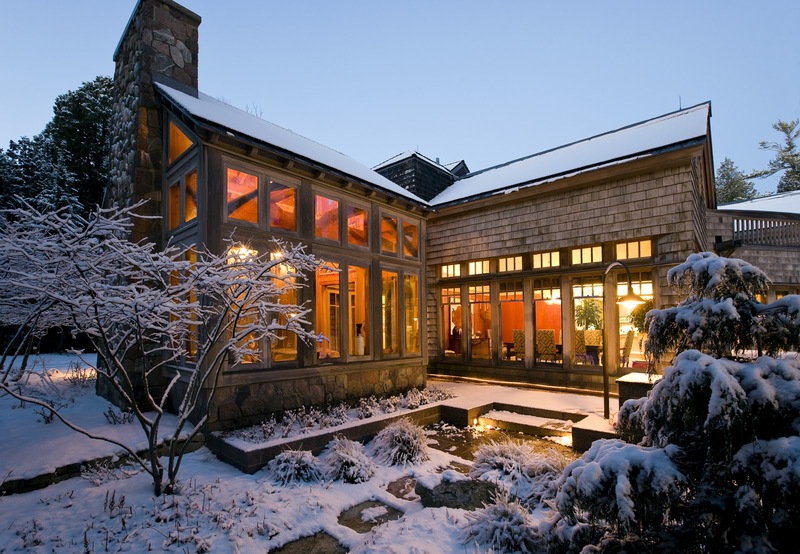 This beautiful location overlooks the Lake Michigan Shore in Wisconsin and was the design of Michigan architects Richard J. Bos, AIA and Barbara J. Bos, PA. Grabill Windows and Doors was selected to obtain old growth/recovered wood to use in window and door products for this project. It was then crucial to find just the right lumber. Grabill's President, Greg Grabill, traveled to Les Gueydan Lumber in New Orleans to select wood for the project. The ancient sinker cypress logs that were selected had been recovered from rivers and swamps in both Louisiana and Florida. This wood was likely cut in the 1800's from virgin forests that were over 600 years old. The timber is very dense with tight growth rings that increase the woods durability to that of teak. When the logs sink in the rivers or swamps they are preserved as they age and with a little drying time they become an eco-friendly green building lumber of choice. Upon Grabills receipt of the shipment of lumber, the project team started to sticker the wood. Although it had been drying for several years in Louisiana, the northern air was less humid. After another 5 months of drying in Michigan, the vacation homes windows were under construction. The first floor of the house contained 72 single hung windows and 29 transoms. The second floor had 96 windows that included casements in both operable and fixed, transoms, arched, round and oval units. Grabill also provided 13 doors ranging from panel doors, to 10 lite double doors, to 4 lite singles entries. This project really encompassed a wide range of the craftsmanship and design abilities Grabill Windows and Doors can provide their clients. With the current interest in sustainable and energy efficient windows and doors, this particular product is certainly worth looking in to.